Todd is buying a second-hand trail bike. Todd borrows the money for a deposit on the bike from Jim. Beverly finds out about the bike and is very angry with Jim. Beverly continues to rant - Todd is her responsibility and she doesn't want him on a bike. Jim is exasperated - she hasn't even talked to Todd's mother about it. Jim tells Beverly she can break the good news to Todd - and break his heart. Todd has got the money out of the bank for the trail bike. Josh comes up and says he's found out that the questions for the brainbox quiz will be on the Education Department's computer. Josh will hack in and get them. Todd and Melissa think it'll be better just to study for the test. Todd goes off to play for his trail bike. Gloria and Lee are back to normal clothes. Gloria is going to put a bet on the greyhounds tonight. 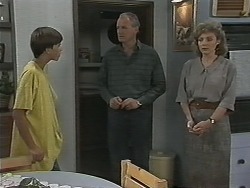 Joe, Kerry and Sky comes in to pass on Harold's regards to Gloria. Gloria nearly tells Joe about her tip on the greyhounds, but Kerry chips in that they have too many unpaid bills. But Joe pops back and gets the tip - Daisy in the fifth. Jim is banging on a tyre with a hammer to get rid of his stress over "women". Matt says he might join a monastery(!) - he's having trouble with Lee too. 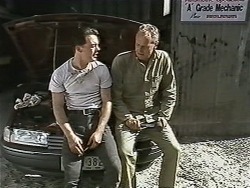 He tells Jim about the physical aspect (or lack of) between him and Lee. Jim advises Matt not to pressure Lee. Beverly is taking a call when Todd storms in. He rants madly at Beverly - he's lost his deposit as well. Beverly tries to say that she's seen so many accident involving bikes, she doesn't want him to have one. TODD: So?! People die in cars, too, but you still drive one! Todd reckons his mother would have let him have it, but Beverly says it's besides the point. Todd shouts that he's saved $450 by working hard for six months after school and holidays. He storms off. Matt calls in for a sandwich and to tell Lee that he might be a bit late home today. Gloria suggests that Lee could finish work a bit early so she can get on with fixing up her house. Matt suggests asking Brian to help her with the curtains, but she isn't keen - she thinks there's something weird about Brian. Josh and Melissa have come round to see Todd's bike. Beverly calls Todd out and he glowers at her darkly. He tells Josh and Melissa what happened and they are appalled. Josh suggests going after the questions on the computer to cheer them up. Kerry is sewing when Joe comes in with a load of bins for recycling. He doesn't look too convinced by the recycling idea, but is going along with it. Joe comes in with a plastic bin - he says it's for his own money-saving project. JOE: Well, in light of the dire straits of the economy, and the general need for belt-tightening all round, I've made the supreme sacrifice. I'm brewing me own beer. Kerry doesn't look too chuffed. Josh is trying to hack into the Educational Department's computer. Matt is closing up the shop. Lee rushes in and says they have to move - Brian just tried to "maul" her. Matt goes off to get the rest of their stuff and sort Brian out. Lee tells Matt she never wants to go back to that place, and he agrees they can find somewhere else to live. Jim is trying to tell Todd that he agrees with Beverly, but Todd points out that Jim was the one who lent him the deposit(!) Todd says he wouldn't even be on the road - just on off-road bike tracks. Jim says that Beverly has the final say whatever happens - even if they don't agree with her. Beverly rolls her eyes. Matt and Lee have crept into No.30 - Matt still has a key for the back door. They decide to camp out in the living room. Matt tells Lee that tonight's their first chance to be alone together properly. She looks rather worried. Jim and Beverly are arguing about the way Beverly handled the situation with Todd. Jim reckons that Beverly has upset his notion of justice. Beverly tells Jim that he made her out to be an ogre and was trying to score points against her. Jim rolls his eyes. Matt and Lee are hanging out. He puts some cushions on the floor. He tries to get Lee to lie down with him, but she pulls away and tells him to leave her alone.